These happy nodding wonders are some of my third generation nasturtiums. I love looking out at our back garden from the kitchen and seeing their round leaves bobbing in the wind like land bound water lilies. 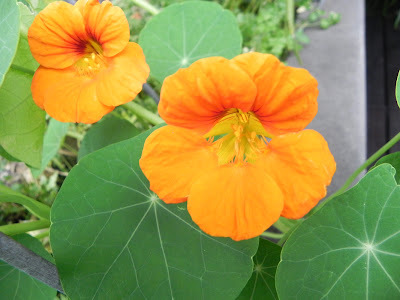 Nasturtium Topaeolum majus contain a natural antibiotic that is kind on the tummy flora, they are super peppery but you can chew a leaf to fix a sore throat or add to salads or on a sandwich (the flowers are edible too). We have a longstanding joke with our GP who asks if I have had my nasturtium leaf when I go for a consult. My mother swears by them and I used to grimace and complain as a child because they are quite spicy, now I love them for the memories they bring.